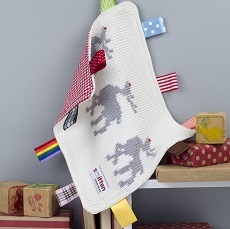 A festive knitted baby comforter edged with bright, textured ribbon tags. Contemporary handmade baby comforter with a knitted front featuring Rudolf the red-nosed Reindeer, backed in Red spotty fabric and edged in a variety of colourful ribbon tags. The combination of textures used to create this knitted baby comforter provide a range of tactile experiences for little hands to explore, encouraging interaction and stimulation. For a unique personalised baby gift, comfort blankets can be customised with a name, initials or date of birth (up to 7 characters). If you would like a personalised baby comforter please select ‘personalised’ from the drop down menu and enter your required text in the box. To customise your comforter with more than 7 characters, please contact us for a quote. All Smitten comfort blankets are knitted in sumptuously soft ‘Baby Bamboo’ yarn (80% bamboo 20% wool) developed by UK based yarn spinner, Sirdar especially for babies. The wool content adds warmth to the yarn whilst the eco friendly bamboo fibres give it a luxuriously soft and gentle handle. Perfect for snuggling against babies’ skin. Woven fabric on the reverse is 100% Cotton. Smitten comfort blankets are approximately 26cm width x 21cm height. Perfectly sized and lightweight enough for little hands to carry around for snuggles on the go. .
Machine washable on a wool cycle up to 40 degrees. Not suitable for tumble drying. Iron if necessary on the reverse woven side.